The spoony survey and ringing team has now finished fieldwork in Jiangsu, China for this year. Through the fog of sleep deprivation and jet-lag emerges the realisation that we got loads achieved this year. As Kane Brides reported, we caught 15 spoonies, 13 of which were unringed and so now sport individually coded small plastic yellow leg flags. This will be a major contribution to our efforts to understand individual migration patterns, estimate annual survival rates and population sizes. Releasing a box-full of spoonies, and hearing them whirr off into the dark humid night air was particularly satisfying. As was seeing them over the next few days, scuttling around on the mudflats; hyperactive little clockwork birds, probing, pecking and dabbling around shallow pools on the mud for whatever tiny food items they could find (we still know very little about what spoonies eat and what use that bizarre bill for; those are questions for the future). 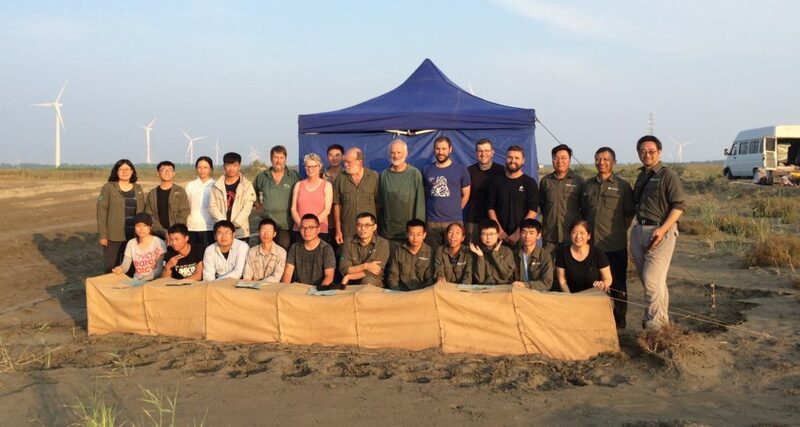 Jiangsu survey and catching team, next to our ringing base camp, September 2018. Photo by the kind lady to whom I gave my camera! 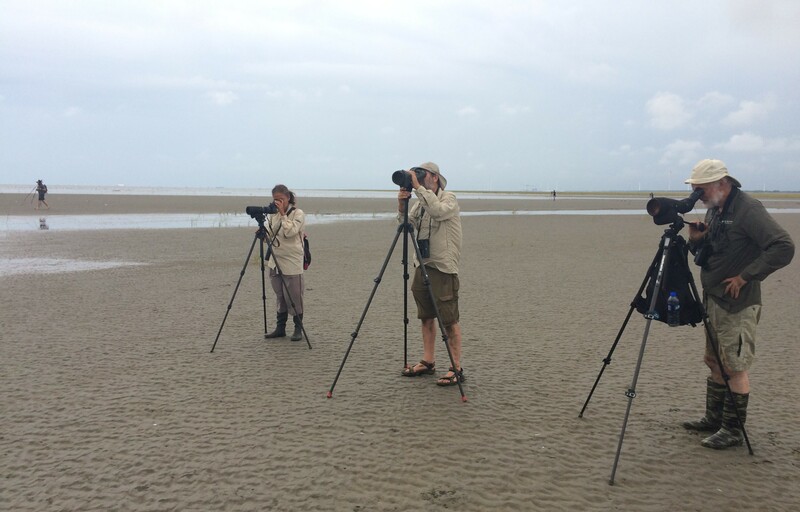 We spent a lot of our time scanning flocks of waders out on the mudflats, looking for spoonies and estimating the ratio of flagged to unmarked birds out there. Once we have more resightings of marked birds from elsewhere along the flyway over the next few months, we will be able to use these data to make another formal estimate of global population size. But Kane’s photo of 6 spoonies in that keeping box is likely to be in the order of 1% of the whole population. Take care with that box! Our flock scanning has told us already that Tiaozini, the best site for spoonies in Jiangsu, has around 200 individuals staging and moulting there this year. So the statements from the Chinese authorities earlier this year that Tiaozini is planned to be included within the boundary of China’s first application for a Natural World Heritage Site in the Yellow Sea is to be warmly welcomed. The flag sightings and flock scan data we have been collecting also tell us that we have a very significant proportion of the world population staging and moulting across all our Jiangsu study sites. But not 100% by any means. Maybe about half? So, where are the rest? If you’ve read the earlier blogs from the fieldwork team in Russia this summer, you’ll remember 3 satellite tags were fitted to adult spoonies on the breeding grounds in July, in the hope that they might reveal one or more moulting areas elsewhere. …and it looks like those tagged birds have delivered the goods. Two of them have been in the same location for over a month now, and must be going through their annual moult there. So, where are they? North Korea! This is potentially a huge step forward, if we really have found a second key moulting area for spoonies. It is hoped that future ground surveys will be able to count them there. Scanning for spoonies, Jiangsu Province, China in September 2018. Photo by Guy Anderson. For me, this brings home just how essential international cooperation for spoonies is, and will continue to be. 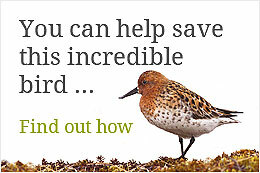 The partnership between conservationists and researchers in Russia, China, all the other range states in East and South-East Asia, and a host of countries worldwide, is working hard, and well, together to understand these birds and so help their countries look after them all along the thousands of miles of their flyway. As we packed our muddy and dust covered gear for the journey home from China, one of the relentlessly cheery and enthusiastic students from our research partner, Nanjing Normal University, gave me a thumbs-up and said ‘see you next year, right?’ Now, that’s the spirit that will help save spoonies! Brilliant! Very exciting news especislly about the possibilities in North Korea. Well done everyone, stunning work! Great news from Evgeny last week. Kamchatka team of Yuri Gerassimov ringed during August over 3,200 waders including 10 SBS (if to be exact 9 new SBS and one re-trap of our young birds of this summer). So together 9+15 = 24 extra SBS flagged this autumn – great job In addition to 30 wild chicks and 8 adults + 22 HS birds in Russia – total of 74 SBS with individual flags added to the flyway this year. Really really exciting news. Great work! Keep it up! Brilliant! Well done everybody, and very promising news!